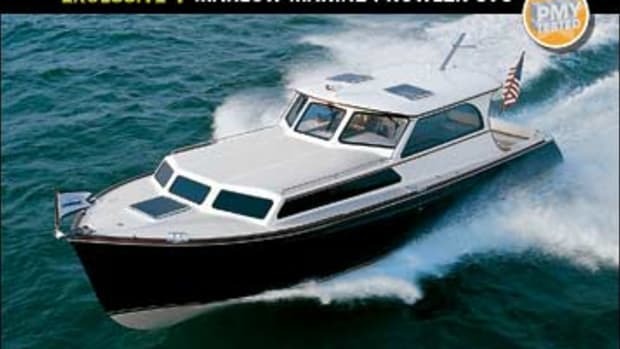 What does a cruising couple do once they realize they miss their Marlow 57? Simple— they build a new 61. Are you kidding? The birds are walking today!” was one response our photographer received when he was calling helicopter pilots to arrange a photo shoot. It was, in meteorological terms, a hellacious day. Wind, rain, lightning. Perfect for testing the new Marlow 61E MK 2! 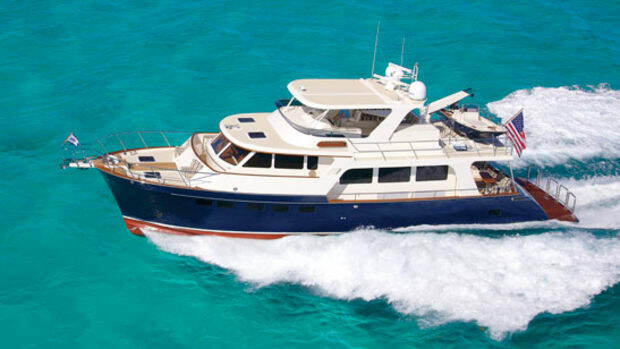 Our sea trial wasn’t for the green of gills, but it easily proved the mettle of this latest addition to the Marlow line of offshore cruising yachts. 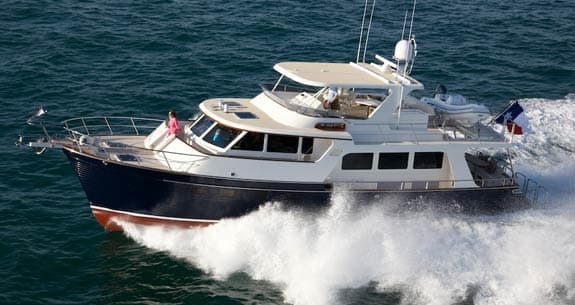 I omit the word “trawler,” not for fear that David Marlow will whack me, but because this yacht lifts her skirts and gets up to an untrawlerlike 27 knots if you need to go somewhere in a hurry. The genesis of any yacht is interesting, but this particular Marlow 61E MK 2 is unusual. The owner of a Marlow 57 decided he wanted to do the Great Loop (you know—the long jaunt around the eastern United States), but felt he needed a smaller yacht for the locks and rivers. So he sold his Marlow, bought a much smaller boat, and was chugging along on his adventure when a Marlow passed him. And so this Marlow 61E MK 2 was built specifically so that this owner, and particularly his wife, could enjoy the comforts of a Marlow while doing another Great Loop. You can grasp the essence of the 61E from the pictures and the layout, but it’s the details that make such a difference. Take, for example, the teak interior. The entire thing comes from a single log, which is then carefully grain-matched throughout the yacht. The master stateroom is as you’d expect: palatial in size, with his-and-hers heads separated by a shower, plus four hanging lockers, and a bureau with liveaboard drawers. Using the full 18-foot beam, the stateroom includes a settee so the owners can have their own sanctuary. But the first surprise on the redesigned 61E is the VIP cabin forward, which has been greatly enlarged to provide an almost-master suite. No guest will feel like a second-class citizen with all this space, plus an oversized head with shower. Next surprise: very civilized crew’s quarters abaft the engine room. These owners were considering using the space for storage since they are owner/operators, but David Marlow convinced them that having additional accommodations would be perfect for a couple of teenagers or for a future owner who wants a captain. Finished to the same high level as the guest areas with a high-gloss teak-and-holly sole, there are two comfy bunks (single and double) plus a private head with shower. Even better, the main access is via stairs from the cockpit for safety while underway. The saloon is warm and inviting, with large windows and meticulous joinerwork everywhere. I liked the desk built into the forward corner, complete with file drawer, so one can work if necessary while cruising. The pilothouse level includes the galley, and I’m sure this is where everyone gathers while underway on days when the bridge is not comfortable. 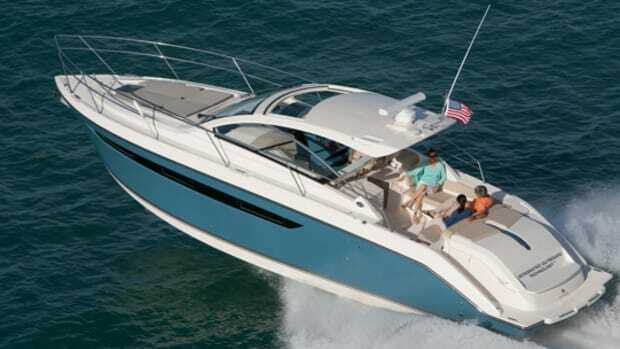 The J-shaped folding dining table wraps under the windshield, the skipper has a pedestal seat, and the chef is part of the action. 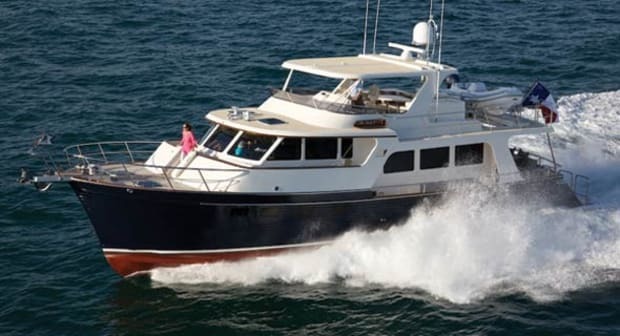 The galley is open fore and aft with overhead cabinets and acres of granite countertops, plus four Sub-Zero drawer fridges. I liked the seamanlike pot clamps on the Dacor four-burner cooktop, too. In looking over the lower helm, it’s clear that the owners didn’t cut corners when it came to electronics, communications, or other systems that would make their Great Loop safe and easy. For starters, the Twin Disc Quickshift transmissions with trolling valves make for fingertip maneuvering without the usual clunk-and-jump. This is augmented by an Italian-made Xenta VMA Plus joystick that neatly merges the conventional prop system with hydraulic Side-Power bow and stern thrusters to give the Marlow pod-like maneuverability (See “Comfort and Joy,” on page 50 of the August issue). It’s perfect for short-handed cruising, and this 61E was equipped with matching joysticks on the bridge and in a fold-out cockpit docking station. Up to three more stations plus a wireless portable can be added, giving complete flexibility. Those 30-horsepower Side-Power thrusters are continuous duty, too, so they can be used to pin the Marlow against a dock while the owners tidy up the lines and fenders. And, like so many systems aboard Marlows, there are dual Side-Power power packs for complete hydraulic redundancy. A pair of Garmin GPSMAP 7215 monitors handle the GPS, radar, chartplotter, and onboard cameras, and the yacht also has a FLIR night-vision system for safe operation in the dark. Engine-room access is via the crew’s quarters, and Marlow has cleverly included a door from the stern platform through the crew shower as well, so there won’t be oily footprints across the teak cockpit when service techs are working from a dock. benchmark for other builders to emulate. Two Onan 17 kW generators are outboard and accessible, and this 61E has been thoughtfully equipped with everything from a Charles Industries Iso-Boost transformer to an ultra-reliable 900-gallon-per-day Aqua Matic watermaker from Sea Recovery. One specific owner request was a large and well-equipped workbench in the engine room, providing the perfect place for onboard tinkering. Access to the flying bridge is either from the cockpit, with a curving and solidly railed stairway, or from the pilothouse. 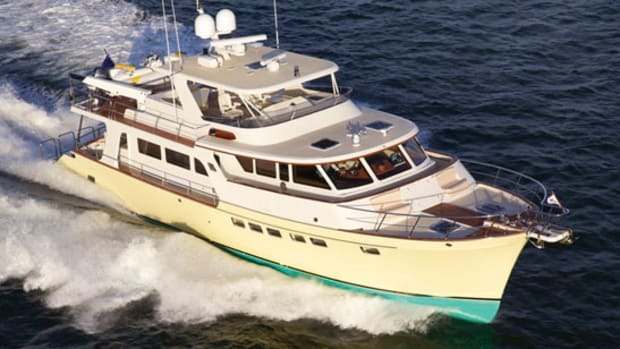 The bridge is designed for entertaining, with an outdoor galley hidden in a fiberglass console to port with a Wolf grill, Sub-Zero fridge, sink, and storage. Opposite is a table that seats four easily, while the boat deck aft is capable of handling a large center-console inflatable. The helm on the bridge is a simplified duplicate of the lower station, with a curving fiberglass console in front of twin Stidd pedestal chairs. Dual Garmin monitors and the Cat digital panels are in the line of sight for the skipper, and I’ve always liked the dedicated Lucite chartbox next to the helmsman on Marlows. One piece of clever engineering added specifically for the planned Great Loop adventure is the hinged electronics arch that folds aft complete with the radar, satcom domes, and mini-mast. This gives the Marlow 61E an air draft comfortably lower than every bridge on the Great Loop passage. 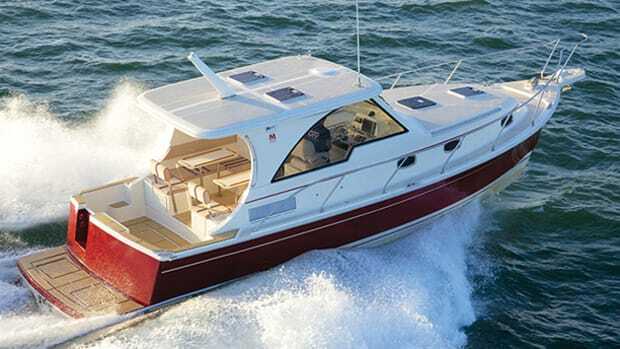 Another thoughtful addition is the pre-planning for shore power, since you don’t always get to choose where you moor: sometimes alongside, sometimes stern-to or Med-style, sometimes bow-in. 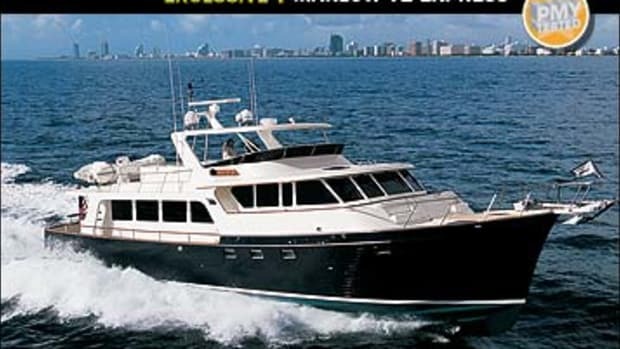 This 61E has four Glendinning Cablemaster reels: two forward at the bow, two aft from the transom. Cable TV and phone hookups are also duplicated, so there should be no possible situation where you can’t have shore connections, except at anchor. Underway, this 61E has a pleasant blend of speed and economy. 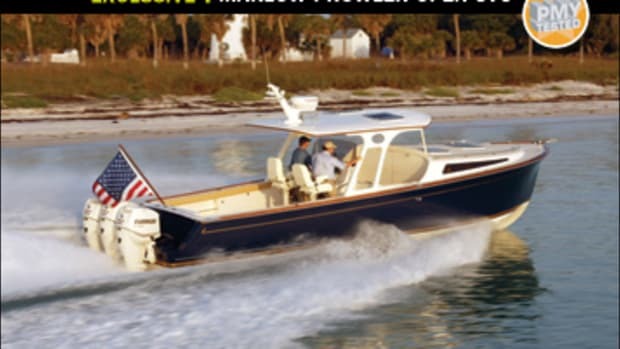 She uses the same well-proven and seakindly hull that appears under Marlows from 57 to 61 feet and has the proprietary Marlow Strut Keels that provide prop protection and down-sea tracking. In admittedly ca-ca conditions, we topped out at 27 knots with 53 percent fuel and full water. Even in cross seas our windshield stayed dry. 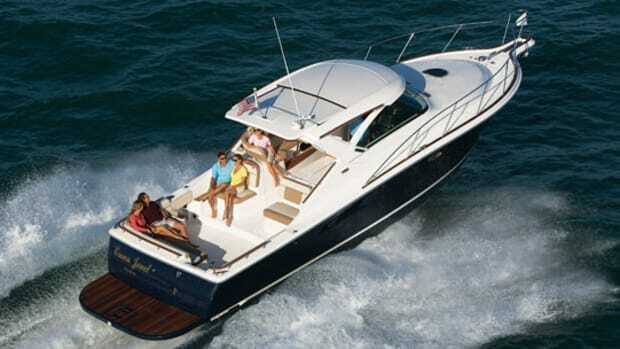 Perhaps even more pertinent to most owners, the Marlow 61E eats up the miles at 1200 rpm, which gave us an 11-knot cruise with a 22-gallon-per-hour fuel consumption that shouldn’t cause your credit card to melt. On plane at 55-percent load, we were doing 17 knots but we had doubled the fuel consumption to 50 gallons per hour. You may not always want to go fast, but having that choice is a wonderful alternative. There are times, such as when trying to outrun a squall, grabbing the last mooring, or getting an unhappy child to shore, when economy is a less important consideration. I admit that I love Marlows. 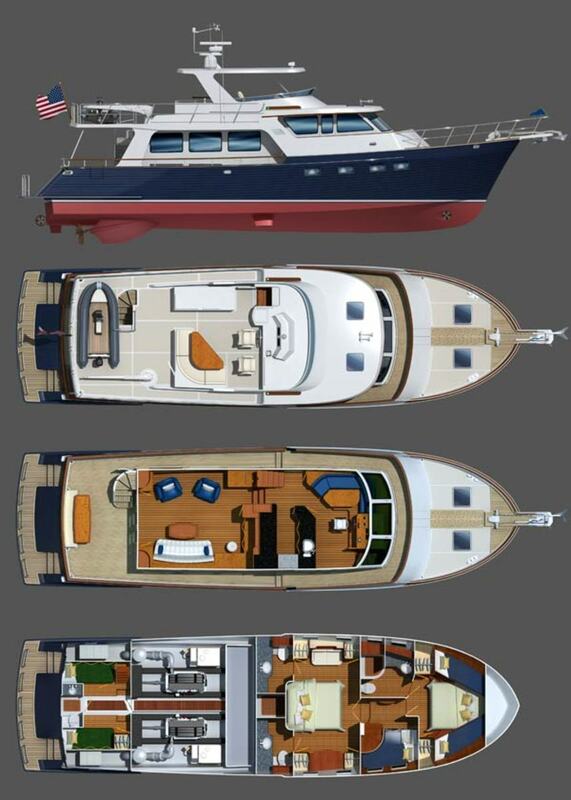 They are designed and built with care, beautifully finished, and equipped in a seamanlike manner. Whether you’re planning a Great Loop or an offshore adventure, the Marlow 61E Mk 2 absolutely has to be on your short list. 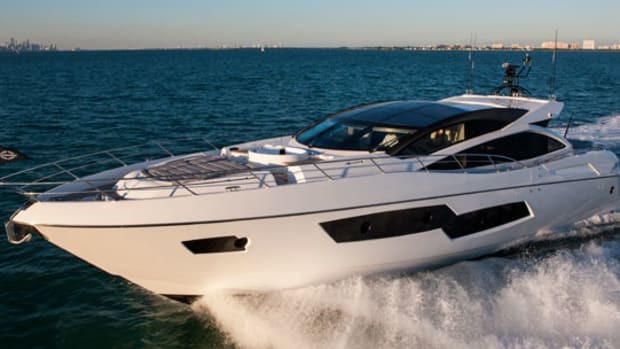 Notable Optional Equipment: Folding electronics arch; two-stateroom interior; 2/1,015-hp Caterpillar C18 diesels; Xenta joystick controls; Side-Power stern thruster; Garmin electronics; FLIR night vision; Sea Recovery Aqua Matic watermaker; Seatorque shafts. 800 gal. fuel, 300 gal. water; 4 persons. This article originally appeared in the October 2012 issue of Power & Motoryacht magazine.